I have decided on a new name for Kaleidascope Agate. As mentioned on my other designs for this stone, this stone is technically not an agate, but a conglomerate. It is a collection of Malachite, Chrysocolla, and Fluorite. I have decided to name it Technicolor Dream. I think the name fits! This pendant is set in a Sterling Silver bezel. $107.00 including free shipping within the US. 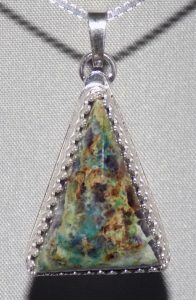 This special Technicolor Dream and Sterling Silver pendant is approximately 1 3/8″ tall, including bail, and 3/4″ wide. The necklace includes an 18″ Sterling Silver Chain.